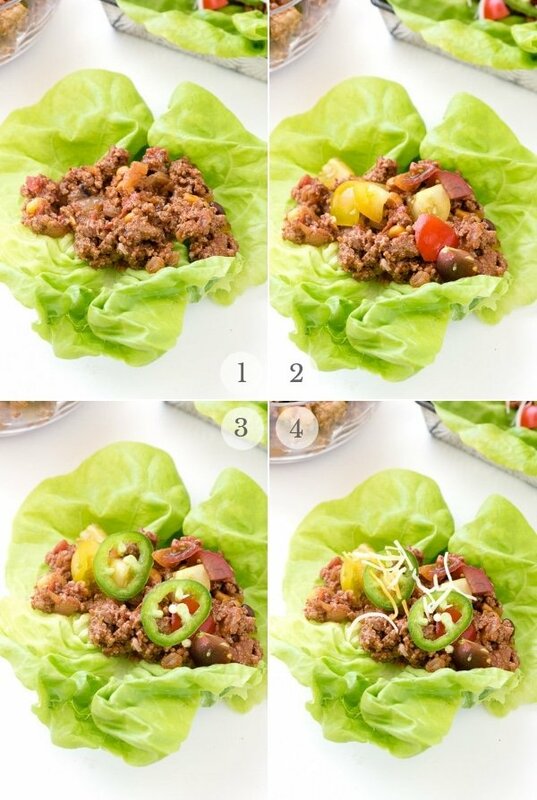 Lettuce Wraps are easy and fast to make. Fill them with taco meat and toppings and dinner is on the table in 10 minutes! Lettuce Wraps are a fresh idea for a main dish anytime of the year. My original idea came from a local burger joint that offers their burgers wrapped in lettuce. It’s perfect for those gluten-free (me) and carb watchers. I loved the texture of the hot burger and the cool lettuce, along with the texture of the lettuce with the meat. 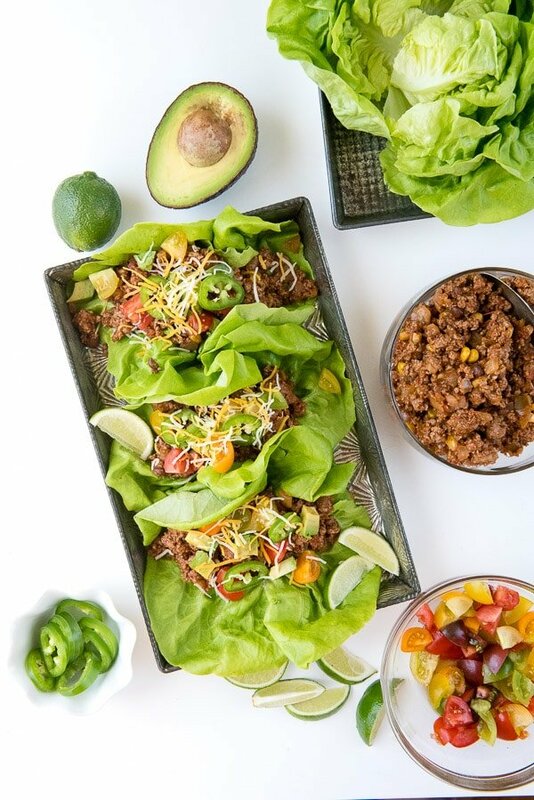 I created these Taco Lettuce Wraps in the same spirit and love getting them on the table in 10 minutes too! 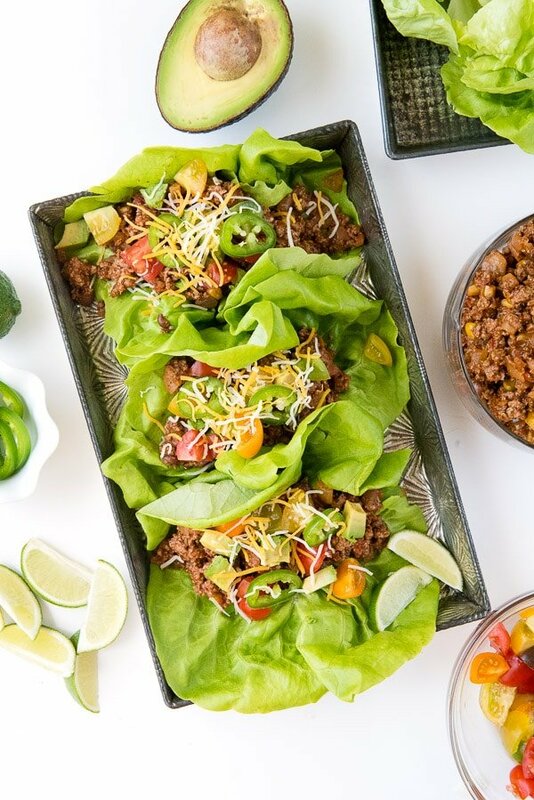 Lettuce wraps are a fresh, flavorful main dish option that is great year round. Instead of using a flour-based wrap or tortilla, filling ingredients are added to fresh lettuce leaves to roll and eat. 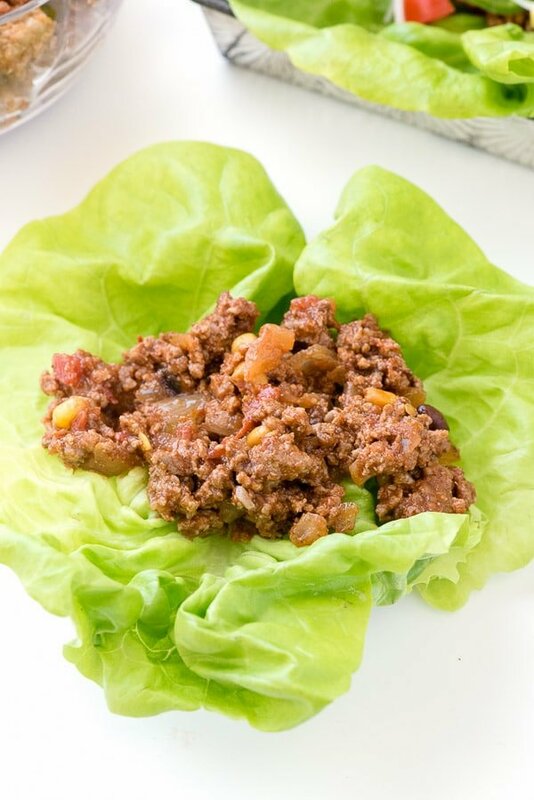 Lettuce Wraps are fast and easy to make. They are perfect for a fresh-flavored meal. Why make them? All lettuce is not created equal for this type of recipe! Though cooling Iceberg lettuce is a perfect complement for Mexican flavors, it’s not very ‘bendable’. It can crack and split leaving the taco ingredients in your lap potentially. Romaine lettuce has a nice boat-like structure perfect for filling, but honestly I don’t love the flavor with this type of recipe (I’m mad about it in Caesar Salad however). The preferred lettuce for these lettuce wraps is Butter Lettuce. The larger leaves on the outside of the lettuce head have a nice cupped shape, a light flavor and easy bite. 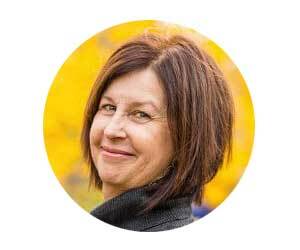 There is no tugging to bite through the leaves. The leaves are pliable and thick enough to securely house the filling and complement the flavors of the taco filling. 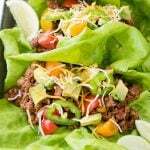 Making Taco Lettuce Wraps is very fast and easy! They seriously are done in 10 minutes! In a large skillet over medium-high heat, warm the olive oil. Add the onions and sauté until translucent (3-4 minutes). Add the ground beef and cook until no pink remains. Drain any excess fat if needed. Add the salsa and taco seasoning and stir to fully combine. Cook for an additional 1-2 minutes. The Lettuce Wraps can be assembled, plated and served. Or set up buffet style for diners to serve themselves! Break off any of the center rib that extends past the end of the lettuce leaves and discard. This allows a flush bottom to the leaf. Take two similarly sized large lettuce leaves and overlap the bottoms by about 1 inch. 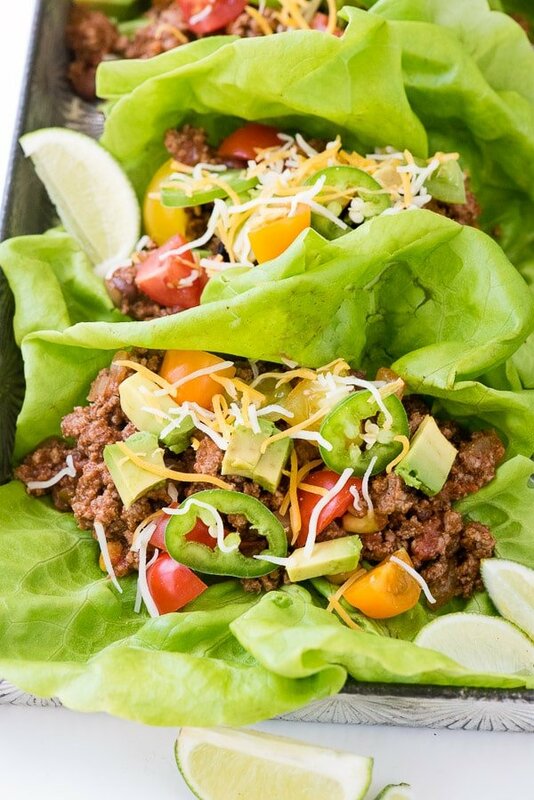 Add approximately ¼ cup of the taco meat in a line over the overlapping part of the leaves. Add any desired toppings and serve. If you find you have leftover meat, it can be refrigerated (sealed) for a few days and just reheated to make more wraps. 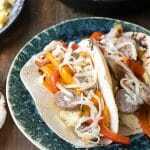 The great part of this recipe is that the filling can be used for traditional tacos as well. 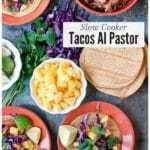 It can be used with soft corn tortillas or in crispy traditional taco shells too. It also can be layered on a salad. 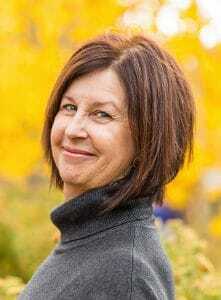 Please SUBSCRIBE and FOLLOW ME on FACEBOOK, TWITTER, INSTAGRAM and PINTERST! 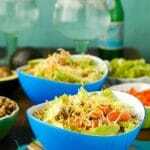 10-Minute Taco Lettuce Wraps and the best of each tacos and lettuce wraps. 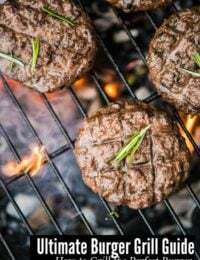 They are loaded with fresh ingredient and the meat is cooked in less than 10 minutes. 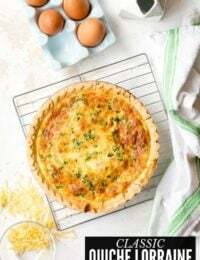 It's an easy meal to serve as a buffet for dinners to make their own with an assortment of toppings. In a large skillet over medium-high heat, warm the olive oil until the surface is rippling. Add the ground beef and cook, stirring often, breaking the meat into small pieces, until no pink remains. Drain any excess fat if needed. Add the salsa and taco seasoning and stir to fully combine. Cook for an additional 1-2 minutes. Remove from heat. Prepare the lettuce: If any of the center rib on the lettuce leaf (the part the was attached to the head) extends past the bottom of the leaf, break that part off and discard. This allows a flush bottom to the leaf. 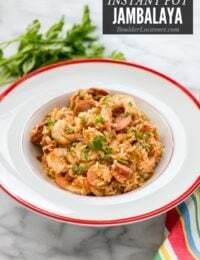 My husband and I are trying to go way lower carb, and this is just the ticket for us!! Thanks!!! Love that I can skip the tortilla and have two wraps instead! I can’t wait to try these. 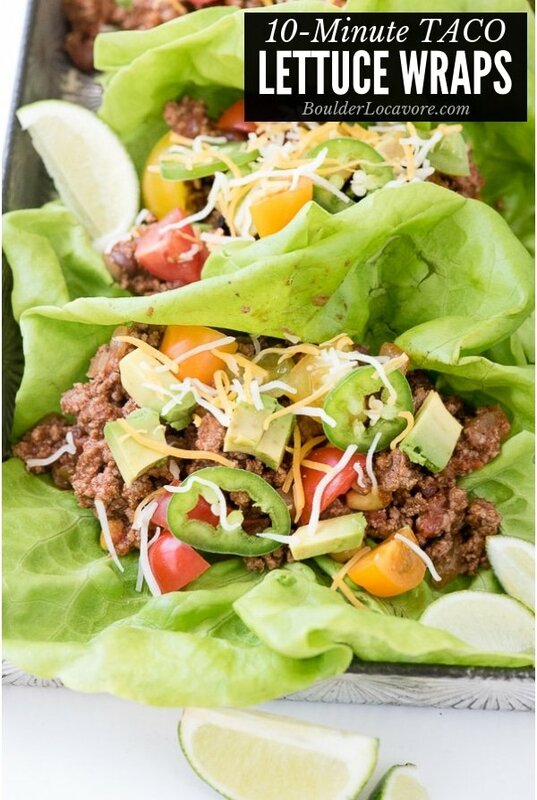 What a great twist and so much healthier than a taco shell. Such a healthier version! Love this! I can’t believe how easy these are! Love lettuce wraps! 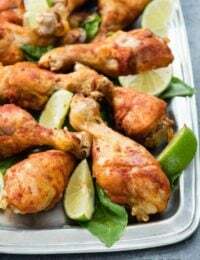 This was a fabulous low carb dinner! I didn’t miss the tortillas at all! I love lettuce wrap tacos! Such a yummy way to get in some greens! 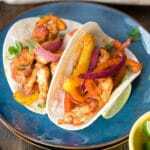 We love tacos in our house, this is such a healthier option! We make these at least once a month! Perfect healthy and easy dinner! 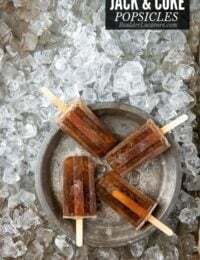 These looks so tasty & are a perfect, healthier option! Love when I can have a meal made in no time! 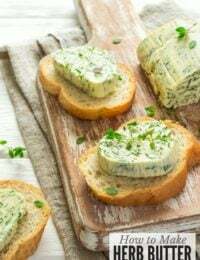 This recipe is truly amazing, perfect for those people who are in a special diet. Gonna have to try this since all of the ingredients are available in the market. Thank you for sharing. Hope to read more and try tour recipes. Crunchy, delicious and healthy. I am loving everything of it. This is so perfect and tasty Dinner.